Awhile back I splurged on a pricy item at Whole Foods, actual wasabi powder and it wasn’t cheap! 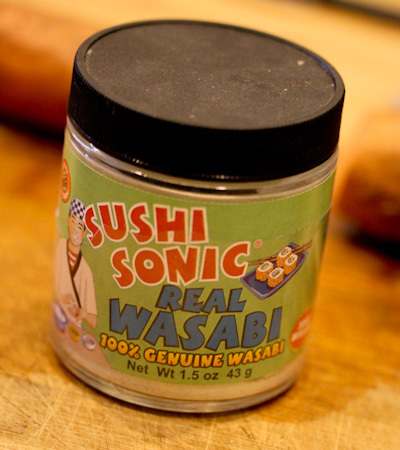 Since the real stuff is expensive to produce, most of the wasabi in the US is actually a blend of horseradish and mustard. That’s not a bad thing, but I wanted to see if the real stuff is any different from the cheaper blends. Sadly, I’ve hardly used this little jar because I keep forgetting about it. But that ended tonight when I saw a recipe for wasabi fries in this week’s issue of VegNews. I would have followed the recipe if I had all the ingredients for it, like russet potatoes and rice vinegar. 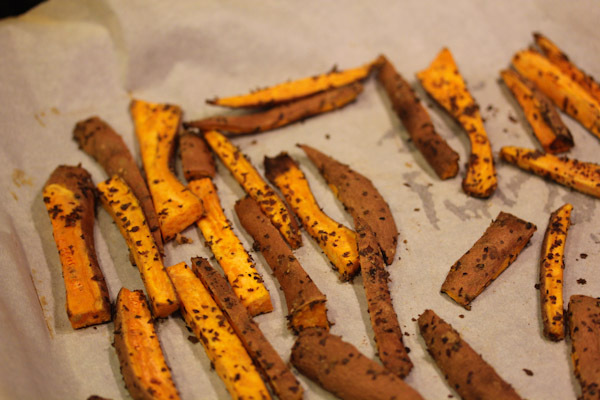 But I didn’t and ended up inventing my own version using up some sweet potatoes that needed to be used soon! Preheat oven for 425 degrees. 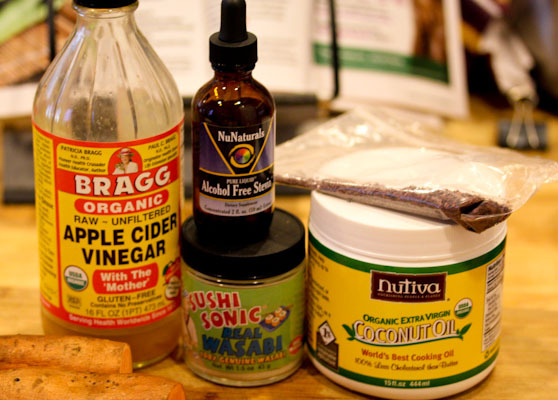 Mix coconut oil, wasabi powder, apple cider vinegar, and stevia in a small bowl until pasty. 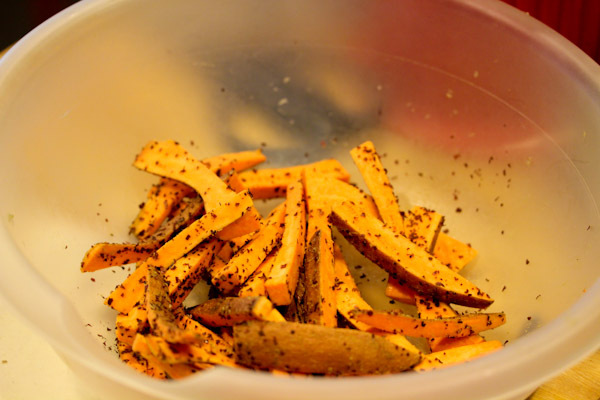 In a large bowl, toss the fries with the mixture and sprinkle in the dulse flakes and salt. 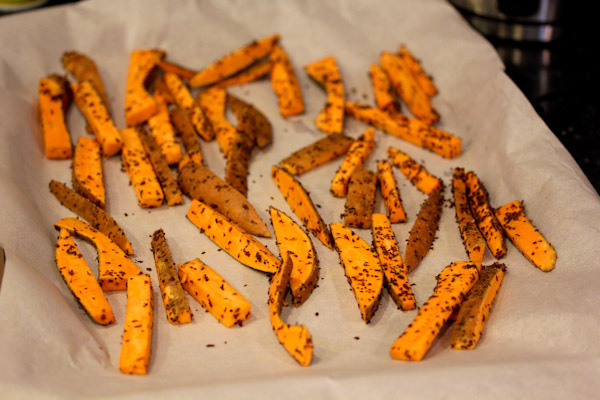 Line a baking sheet with parchment paper and place fries on the paper. Bake fries for 30 minutes, or until edges are crispy. Makes about 4 servings. Summer has officially arrived for me when the raw coconut oil is liquified in the pantry, no softening needed. And it finally is! I managed to keep all the fries in the bowl while tossing, go me! After baking, the fries didn’t look very different, but had crispy edges and a warm, gooey center. 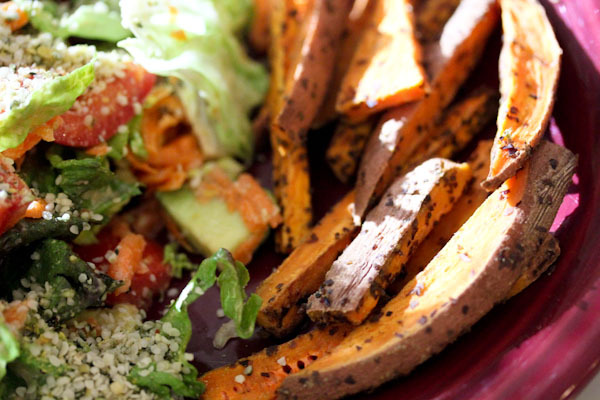 I paired them with a large, avocado-heavy salad, great comfort meal after a day of shopping and tackling house chores. The sweet and spicy flavor is present, but not too spicy at all. 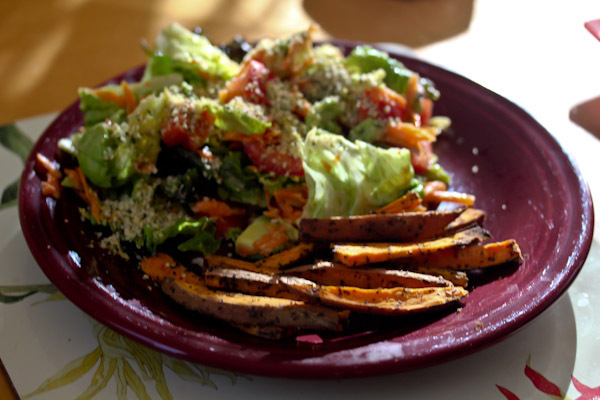 The wasabi worked well with the coconut oil and sweetness from the sweet potatoes and NuNaturals liquid stevia. Simple and tasty, perfect end to a relaxing weekend. Oh wow, I’d love to try these! Coconut oil, stevia, and wasabi (which adds a kick but not full of sodium – a big win for me) Great recipe idea! 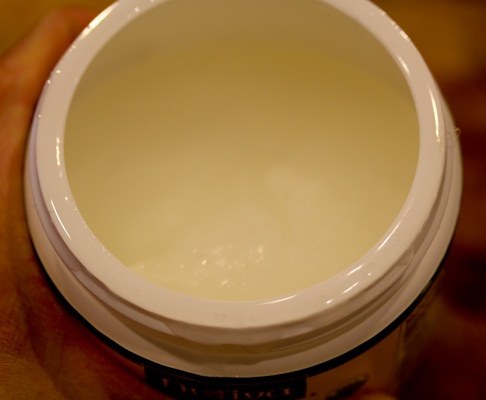 And coconut oil liquifying…mine still hasn’t yet! Thanks, think I need to try wasabi popcorn next! Yum, wasabi mashed potatoes sound awesome, I need to try that next! This is too funny. I saw the jar of coconut oil at the top of the post, and immediately turned around to look at my jar sitting next to the stove, thinking “its been warm the last couple days, is my jar liquid yet?” Not yet here, but I had to laugh when further down in your post I read that you know summer’s here when yours liquifies!